Thierry Mugler will launch The Fragrances of Leather / Les Parfums de Cuir, new limited edition variations on their Angel, Alien, Womanity and A*Men fragrances (see also: last year's Taste of Fragrance / Gout du Parfum series). To embody Mugler fragrance in a fabric, it could only be leather. Inspired by the age-old craft of glove maker perfumers, Mugler took four of his signature scents and enhanced them with the warmth and richness of leather. The fragrances include a "natural leather" note matured in vats at Clarin's Strasbourg facility for four weeks. The Thierry Mugler Fragrances of Leather collection will launch this fall. Angel Fragrance of Leather, Alien Fragrance of Leather and Womanity Fragrance of Leather will be available in 30 ml Eau de Parfum; A*Men Fragrance of Leather will be in 100 ml Eau de Toilette. Looking forward to trying this, I have the original A*Men as well as the Gout. Yes, wonder why the men’s is so big? Maybe we’ll be lucky and it was a misprint. All of the previous A*Men special editions (Pure Coffee, Pure Malt, Pure Havane, and Taste of Fragrance) have been 100-mL bottles only, so I expect they’re just using the same bottle for every one. Now that they’ve added coffee, whiskey, tobacco, and leather to the original A*Men, what’s left? Tweed? Ha ha! Maybe you’ve just hit on the next big thing. Adding a “wool,” note to fragrances. I’m only half kidding. Robin – one of my pet peeves is that special edition fragrances for men are almost always big size (100 ml or more) while women’s special editions vary more in size and many are smaller. It irks me that when I go to Sephora there are many many fragrances for women in 30 and even 15 mil sizes. For men there is almost never anything smaller than 50 ml. I’m going to defend Mugler – the A*Mens are EDTs, and the women’s are fairly dense EDPs. Also pre-press materials seem to imply the women’s come in little leather sachels; maybe the A*Men doesn’t, it would look weird if it did. So the women’s packaging probably costs more. Oh, interesting. I missed last year’s Gout series but I liked the liqueur ones which they did a couple of years ago and leather is one of my absolute favourite notes. The Gout series was nicely done, and generally TM does a better job than most with flankers. Leather is usually not my type of thing but I’ll be happy to sample when possibility occurs. He made a coffee frgrance a few years ago that was great. It would be interesting to compare this leather fragrance with the Eau Sauvage leather flanker (Christian Dior). Now THIS is a line of flankers I can get behind. Leather is my siren song; I cannot resist a good leather accord in a perfume, and I’m alread a Mugler fan, so these are must-sniffs for me. For some reason I’m having trouble picturing Angel with a dash of leather, but I can see it working with A*Men, and Alien’s jasmine coupled with leather could be brilliant. Sounds lovely, and the special bottle is beautiful. The little leather tag, and the 20th Anniversary stamp are just adorable! I love the original Alien, so I will definitely be smelling this version when it comes out. So Womanity’s little caviars will be wearing tiny little leather caps in the fall. Finding Nemo Part XII. Can someone explain to me why they’re claiming that they’re soaking leather in these perfumes to give them their essence? Isn’t leather usually imparted without using actual leather? Why would you use leather? I don’t get it. Do vegans need to beware of these Muglers? There is a special circle of Hell for meretricious PR people, who will have to answer questions like this for all Eternity! Thank you; I have been wondering the exact same thing. This leather maceration thing sounds ghastly, like something Grenouille would do. I hope it’s merely a PR conceit. The article at Cosmetic World said “natural leather” — their quotes. So I have no idea what, exactly, is being aged in vats. It could be an accord that smells like leather, that is made from natural perfumery materials (in other words, no actual leather involved), or it could be something else. I’ve seen the press materials and “making-of” press video for this and it appears as if they actually soaking leather in the perfume essence and maturing in them in stainless steel vats. The concept behind it is to use leather in the production process rather than just adding a leather note. There are images of strips of leather being cut-up and added to vats of essence. LORD MERCY JESUS!!!!!!!! I CAN’T WAIT For that A*Men Leather Version… Instant Covet! All the Flankers are DAMNABLY Awesome! (Except that Gout one… didn’t like that one bit, too sweet and Vegetal…. YUCK!) That Bottle is Want-A-Licious!!!!! YUM! GIMME GIMME GIMME A*Men After Midnight! Can we please talk about how GORGEOUS that Alien bottle is!? 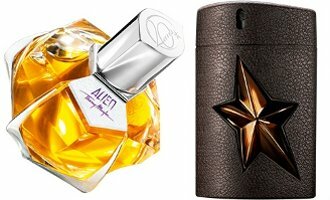 And though leather + Alien frightens me a bit, I will need to smell it, wow! But isn’t it odd how the juice’s colour is so way, way different to original Alien? More like one of the Sunessences (which I love). This sounds interesting. I like and own a small bottle of Womanity, and I’m definitely curious about what a leather version would be like. I found the Taste of Fragrance version of it too sweet. I’d also be interested to see how the Angel and Alien versions turn out. I really want to like Alien, but I get a weird Windex-y note that kind of ruins it for me.. but if a leather note replaced the Windex note, or at least hid it.. that just might work. I didn’t much care for Angel the last time I tried it, but a leather version might be interesting. Would be nice if they offered a coffret set of the 3. I can’t wait to try these. I’ve heard some pretty good things. Mugler seems to do well with the flankers. I definitely want to try these, but the idea seems a little odd to me. Taking a single note and adding it to different fragrances, it’s just…weird. No offense. The concept seems a little bit…random. I’m looking forward to these – some of the Gouts set off my gag reflex, but I am an Angel fan in general. Not so much Alien or A*Men, but I’ll still smell them. I like leather. I got a chance to try the A*Men yesterday. I have very hush-hush connections… LOL. I just happened to be wearing Oscar de la Renta pour Lui at the time- another leather frag- and the A*Men was totally blown out of the water by the ODLRPL. I didn’t get the leater note at all. On me, it was just like a softer, milder, watered down, regular A*Men. There’s a little bit of mint and of some non-distinct green note. The dry down is a very soft vanilla. I had originally pre-ordered a bottle, but I think that I will cancel my order. It was not THAT great. Good to know, thanks. And that’s not too bad a price! I am terrible! I did not, I did try Gout and liked them very much, and so assumed these were also good, but didn’t ever get to them. There is too much product, I cannot keep up. I wish they would make that Liqueur Angel part of the permanent collection. You enjoy your Cuir, that’s a great present! No, thanks! Feel kind of disappointed, like they’ve already covered this theme enough, right? But if the Angel is nice, I’ll be happy. Good luck on the Womanity. I’m sure the Angel will be easy to find.